Let’s face it. We’ve all felt angry. Anger and depression often go hand in hand and it’s important to understand the link between the two but there is a lot of bad or incorrect information out there about it. Myth #1: Either anger causes depression or depression causes anger. Truth: No one really knows what the link between anger and depression actually is. This is one of the most prevalent myths. It goes something along the lines of: while anger is a natural emotion that can occur in any person regardless of age, anger is often caused by depression. Since depression based anger looks just like ‘normal’ feelings of anger, the depression often goes untreated. The reason behind this thought is that the depression is a result of anger turned inward. This myth goes something along the lines of as a child you were taught to ignore your feelings. For example, if you are a woman you were most likely encouraged to care for the needs of others above yourself and that expressing your feelings and showing your anger was bad. If you are a man you were probably told not to cry. Most men were raised to keep control of their emotions and deny their feelings of pain or sadness. Because of what society has taught you, you are unable to express your feelings and have become trapped by the feelings you do experience. Since there is no outlet these feelings turn inward and manifest as anger which leads to depression. The other major theory is that depression causes anger. This is based on the same principles. Since you couldn’t express your feelings and never learned the techniques to truly make your feelings known you are depressed and that depression you feel is coming out as anger. While that all sounds plausible, the truth is no one really knows what the link between anger and depression actually is. It could be that anger causes depression or depression leads to anger but then again it could be that the anger is manifesting for a different reason altogether. There is no conclusive scientific evidence that establishes the link between the two. Myth#2: Anger is a symptom of clinical depression. Truth: Anger is not listed as a symptom of depression in the DSM-IV. While it is the prevailing common belief that anger is one of the symptoms of depression technically it isn’t since it isn’t listed as a symptom in the Diagnostic and Statistic Manual published by the American Psychiatric Association – the diagnostic bible used by mental health professionals; however, for all intents and purposes it is treated as if it is a symptom of depression. Myth #3: It’s impossible to know who is at risk for depression related anger. Truth: There are some common risk factors that have been shown to play a role in the development of anger and depression. Myth #4: I’m not depressed. I can handle my anger on my own. Truth: If you can’t control your feelings of anger, you need help. A lot of people are in denial about their anger. These feelings of denial serve as obstacles to getting help. 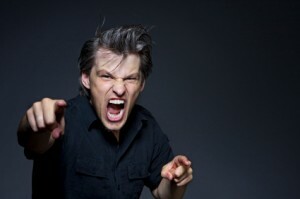 You may have issues with anger that require help. Myth #5: Treatment is a bunch of hooey and doesn’t work. Truth: Anger management treatment and treatment for depression do work. Treatment is available for both anger management and depression. It is important that you talk with your medical health care provider to see the best course of treatment for your individual circumstance. The most common treatment for anger management is therapy. The therapy can be either one on one or in a support group and is usually led by a mental health provider such as a psychologist. In this setting you will learn positive emotional coping skills as well as learn techniques that help you control your angry thoughts. It will also help you get more in touch with the root cause of your anger and help you overcome the feelings of anger as well as examine ways of regaining control. The most common treatments for depression include medication – usually anti-depressants – and therapy that is similar in style and function to the one above for anger management. Treatment for both depression and anger is available and it does work. Click here to see how to treat depression.